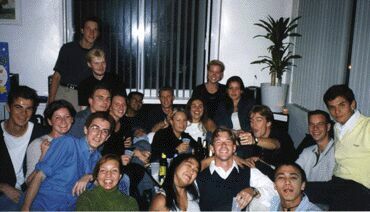 During spring 1999 I was accepted to take part in Lund University's exchange program at Concordia University, which is situated in Montreal, Canada. This was to become one of the most exiting and eventful years that I have ever experienced. Before leaving for Canada I spent the summer of 1999 in London, England working for Citibank as a summer intern. This was to be the starting country of my voyages (Click here to view map), which took me around plenty of countries and cities during the forthcoming year. Working in the banking "City" district of London was an interesting and educational experience. London is known as a very hectic city where people work extensive hours during the week (average 72 hours/week) and time really seems to be money. The city itself is very attractive and I must say that it facilitates a venue of very indigenous and trendy clubs and restaurants. On the other hand it is a very expensive metropolis as you easily pay up to 30 USD for entrances to clubs and the most expensive beer I stumbled on was 10 USD a bottle. After spending a busy summer in London I was more than enthusiastic to get on with the next stage of my year and begin my exchange student life in Montreal. I arrived in Montreal in the end of August 1999 with two very heavy suitcases but an eagerly adventurous set of mind. I enjoyed the experience of arriving to a new country and new surroundings. It's a mental challenge to discover a new culture and to be able to handle all the practical and formal matters that are part of settling down in a new environment. (You may read more of my experiences in an article published by the local Concordia International Student Association by clicking here). After the first few weeks of running around after apartments and settling down it was time to discover my new school. Much of the orientation was arranged by the Concordia International Student Association (CISA) which brought together all the new students around the world who were to begin their studies on a full time bases or as exchange students. Right at the first orientation event the atmosphere was amazingly encouraging as hundreds of international students met each other for the first time. The fact that everyone was facing the same situation and were in the "same boat" made getting acquainted to other people effortless and after a few hours we already had a long list of friends and phone numbers. The whole year was filled with numerous parties and activities and it was amazing how much we all learned about each other's countries and habits. A group of friends from Finland, Colombia, Canada, Holland, France, Germany, Oman, Mauritius, China, Kuwait, Iran, Brazil and the Salomon islands all together enjoying student life was a very usual sight. Montreal itself is a very multicultural city with the largest diversity of different ethnic backgrounds that I have ever seen anywhere before. It's a beautiful city of 3 million people situated on an island in the middle of the St.Laurent river with an interesting blend of Canadian and European atmospheres. Some people have called it the Paris of North America. Montreal, which is bilingual (French and English), has a huge population of Francophones who basically only speak French which seems to be the only understandable language in the Eastern part of the city. As Montreal is a part of the Quebec Province all official signs such as road signs and commercial establishments must be in French. It also has the highest density of students per capita in the whole of North America, which adds to the cosmopolitan pulse of the city with continuous student parties and cultural activities to participate in. Especially in the summer the island turns into a mixture of festivals and outdoor terraces as people enjoy, for example, such events as the Jazz Festival, the Laugh Festival, the Gay Parade, the Formula One Grand Prix and the International Fireworks Competition running for the whole summer. Concordia University is said to be a very contemporary school, which aims to give students both practical and theoretical skills to cope with present-day challenges. I studied Finance, International Business, Economics and Political Science at the University's Department of Commerce. I also took courses in French both at and outside the university. During the year I travelled to New York two times; once by car and once with my friends from Finland. I went to the Dominican Republic in the Caribbean during spring break 2000 for a week with a bunch of students. I also flew to Los Angeles and Santa Barbara in California to meet a few friends as well as travelled in the near regions of Quebec.